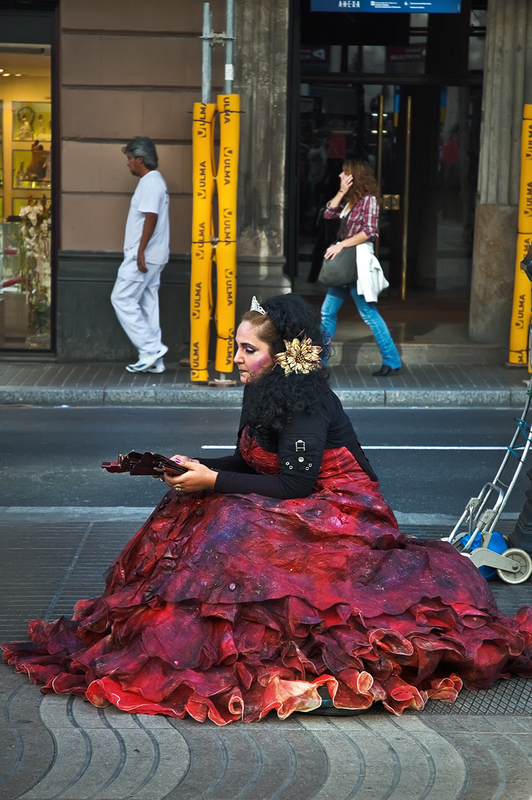 I do not know whether she impersonates a flamenco dancer or an opera singer but as I said in a previous post human statues in Las Ramblas are much more interesting when they are offstage, when you see the person behind the character. Lost in her own thoughts this lady is in some way acting, she is in the middle of yet another performance, the most difficult, the most demanding, trying to make a living in the real world. That red skirt! Wow! Nice portrait of her "off stage!" Great capture, Carlos, and your commentary so true. What an amazing capture. The dress looks like rose petals and the woman inside is an enigma. Beautiful photo, I agree with your text.